Dr J T Lloyd’s brother was Mr Emrys Lloyd, a long-serving and respected County Councillor and owner of the Old Abbey farm. His grandson (of the same name) is now the resident farmer. Periodic fairs were established within the lands of Strata Florida , and on a site not so very far from the Abbey buildings . . . these were conducted on a piece of waste ground in the grange of Mevenydd, and they continued to be well known until quite recently as the cattle and horse fairs of ‘Ffair Rhos’ . . . the monastic tenants of Mevenydd derived much profit from these gatherings attended by traders in wool and other commodities . . . The fairs were, of course, a source of profit to the monks as well, who kept a toll-house in Mevenydd where tolls were levied on all merchandise intended for sale. During the later middle ages, when the domestic pilgrimage was in its prime, visitors to the abbey would no doubt wish to have their visits coincide with the occasion of one or other of these fairs. Local fairs were, probably, pretty well established before any recognisable community took shape, and for the area to be named Ffair Rhos. The Dictionary of Welsh place-names  refers to a few historical versions of Ffair Rhos – Rose feyre, Rosseffayres and Rossefaire – which date back to the sixteenth century. However, pinning down exactly when the region, first became known by its present name (or anything resembling it), would be, to say the least, a difficult task. The aim of this web page is simply to look at what the local community believe to be the origin of the fairs, and their connection, if any, with ‘Yr Hen Fynachlog’. This is a well known traditional story. Of course, it can’t be proved, but it is another piece of evidence, albeit tenuous, to support the notion that ‘Yr Hen Fynachlog’ was, at one time, the ‘home’ of a long-standing monastic community, with an established economy. Why the monks should keep the name ‘Rhos’ is intriguing. Could it be for the same reason that they kept the name Fflur in Ystrad Fflur? These are questions which are considered in the next web page. 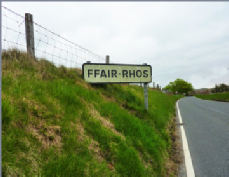 There is little disagreement about the connection between Ffair Rhos fairs and the monks of Ystrad Fflur ; it is generally accepted that it was they who started the fairs in the area now known as Ffair Rhos. However, according to a long-standing, local tradition, there were earlier fairs held at a place roughly three miles south of Ffair Rhos, near ‘Yr Hen Fynachlog’. 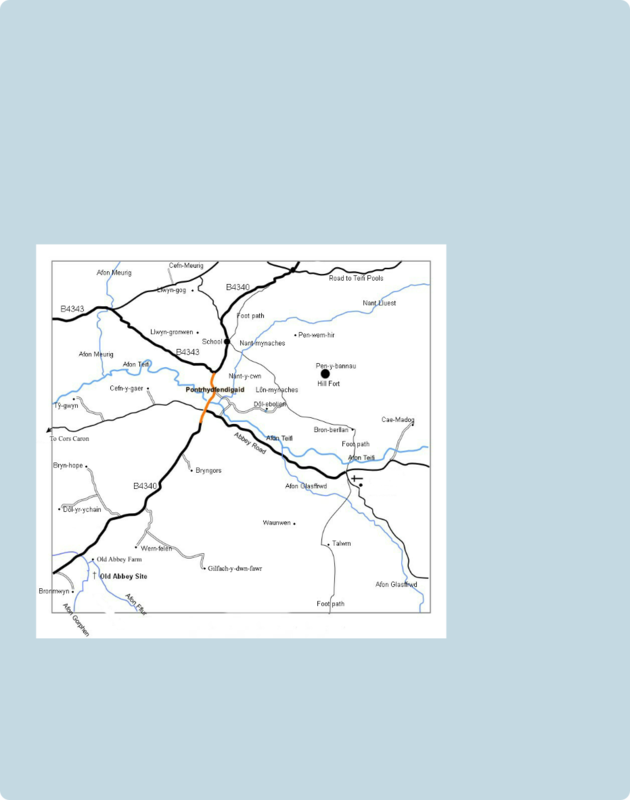 Possibly, holding the fairs on this new land was more convenient in relation to Ystrad Fflur but, more important perhaps, it was close to the intersection of some well-established cross-country trade routes.